Canada currently operates under an “Opt-In” system for organ donation. That means that you have to sign up to put yourself on your province’s list of willing organ donors. However, in a move that puts Nova Scotia first among jurisdictions in North America, the province’s legislature has passed a bill for an “Opt-Out” system also known as “Presumed Consent.” It is routinely said that greater than 80 percent of Canadians are in favour of organ donation, but fewer than 20 percent actually go through the process of registering as a donor or “opting in” to the registry. Here is an opinion article by Michael Enright, host of the CBC Radio show Sunday Morning that discusses the impact Nova Scotia’s decision can make on Canada’s “pathetic” record for organ donation. I invite your comments. Let us bow our heads in gratitude and raise a glass to the province of Nova Scotia. Impossible to do at the same time, I grant you, but give it a shot. A grateful nation has many reasons to thank Nova Scotia: the landscape, Pier 21, the people, lobster, Bob Stanfield, Lunenburg and Joe Howe. 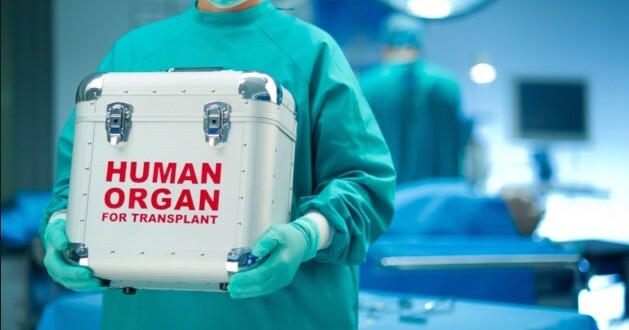 The latest contribution of the Bluenose province to the betterment of mankind came this week when the provincial government introduced a bill to make every Nova Scotian an automatic organ donor. When the bill becomes law, Nova Scotia will become the first jurisdiction in North America to operate a donor system known as presumed consent. Under this system, everyone is considered willing to donate an organ unless he or she makes the determination to opt out. It is used in 20 European countries and has led to an increase in organ donations and transplants. It couldn’t come at a better time. In terms of donation, Canada’s record is pathetic. While more than 80 per cent of us say we believe in donation, only 20 per cent of us have made plans. This entry was posted in Uncategorized and tagged CBC Radio, Culture and organ donation, ethics of organ donation, how do I donate an organ?, How do I save a life?, kidney for russ, kidneyforruss, Michael Enright, Nova Scotia, Opt-In, Opt-Out, organ donation, organs, Presumed consent, Religion and organ donation, Russ Sawatsky, Sunday Morning on April 6, 2019 by kidneyforruss. Out of the tragedy of the Humboldt Broncos bus crash and in particular, the death of Logan Boulet, a renewed awareness of organ donation gained prominence. Six people across Canada benefited from his organs and the Logan Boulet Effect soon followed. Nearly 100,000 Canadians signed up to become organ donors after learning he had signed his own card. Bernadine and Toby Boulet, parents of the late Humboldt Broncos hockey player Logan Boulet, pose at their home in Lethbridge, Alta., on Dec.6, 2018. Please click here to read the rest of the article and then go to this site to see about registering as an organ donor in your province. This entry was posted in Uncategorized and tagged Canadian Blood Services, Culture and organ donation, ethics of organ donation, how do I donate an organ?, How do I save a life?, Humboldt Broncos, kidney for russ, kidneyforruss, Logan Boulet, organ donation, organs on December 26, 2018 by kidneyforruss. I was a stranger and you gave me water… and a kidney! The following article was first published in The Hamilton Spectator and also published in The Star. Their story began with a knock at the door and a gift of bottled water. 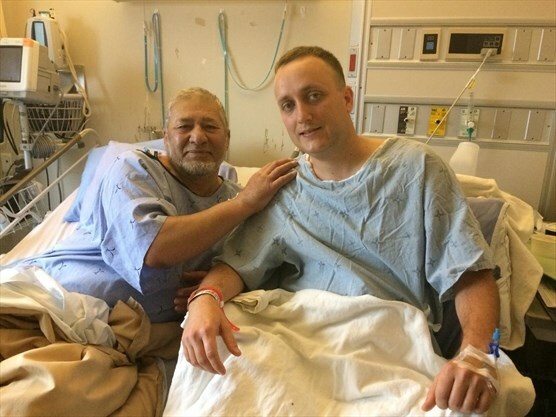 It has become about so much more — a 65-year-old Afghan man and a 29-year-old Canadian man sharing meals, religion, culture, respect and now, almost unbelievably, a kidney. On an August day in 2012, Ghulam Akbar Momand and 18 of his family members moved into a Rebecca Street highrise, only to find their three units without water or electricity due to a building emergency. It was not an ideal welcome to Canada for the Afghan family, who recently arrived in Hamilton via Pakistan. That same day, neighbour Andy Clutton made his way through the 16-storey building along with a group of other residents, distributing water bottles to help those who couldn’t make it out of their units. Going door-to-door, Clutton met Momand — who he calls “Dr. Akbar” — along with the rest of his family living in the building, which included nine children. It was the start of a beautiful friendship between the two men born more than three decades apart in different countries with different skin colours. The story of how the two men went from “friends to donors” grew out of their shared medical experience, explains Clutton, who is recovering well after donating one of his kidneys to Momand three weeks ago. Momand, who was chief and served as doctor in his village of Mangwal, Afghanistan, would routinely perform procedures like circumcisions and pull teeth. Clutton, a father of three, works as a palliative-care nurse in Grimsby. “Even though (Momand’s) English was very poor then, there were many terms in Latin through medical terminology that we could tell stories about, laugh about and learn from each other on,” Clutton said. Clutton’s shift work also meant the two could have tea often. Through these meetings, Clutton learned of Momand’s medical conditions, including slowly deteriorating kidneys that led to him being on dialysis for more than three years. In 2015, the father of 10 had a heart operation. The stress of the surgery caused his kidney function to rapidly decrease. 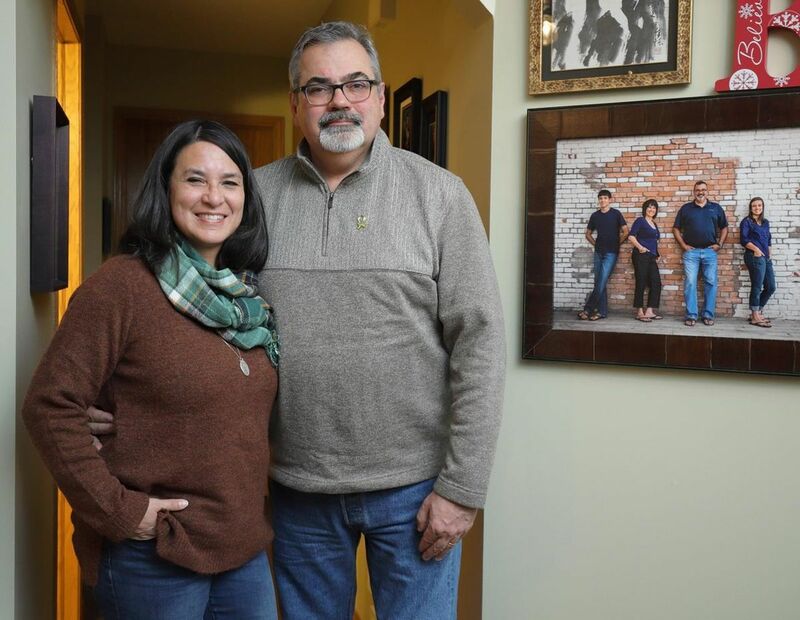 As Momand’s health continued to decline, the family looked into whether one of his children could be a living kidney donor, but none were eligible because both Momand and his wife have diabetes, said Clutton. So, the family approached Clutton and another friend in the building, Varun Rana, for help explaining their situation to other Canadians. 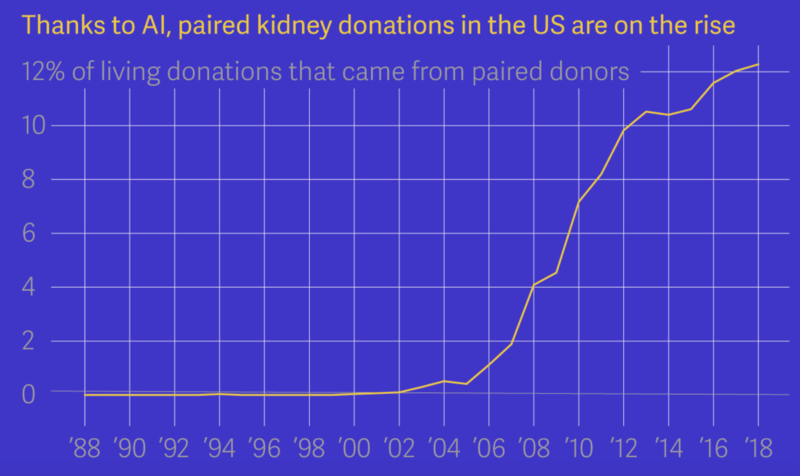 Not knowing what being a kidney donor involved, Rana and Clutton began exploring basic questions, such as eligibility and the length of the process. “Initially, just to find out the facts, but kind of setting our hearts to walking through this door until the door was closed,” Clutton said. Several years ago, Clutton, his wife Shannon and a group of their friends — including Rana and his wife Amelia — moved into the Beasley neighbourhood purposefully to serve immigrants and refugees. “Varun and I were part of a team that would try to use our spare time to help the neighbourhood,” he said. They are part of a small movement called MoveIn, in which Christians move into low-income, high-density communities with large newcomer populations to follow Jesus’ example. “We’ve always explained ourselves in this neighbourhood as trying to imitate the life of Jesus in service to others,” said Clutton, who grew up in the Philippines and went to high school in Toronto. This entry was posted in Uncategorized and tagged Afghanistan, altruism, Christianity, Culture and organ donation, diabetes, dialysis, ethics of organ donation, ethnicity, how do I donate an organ?, How do I save a life?, Islam, kidney disease, kidney donation, kidney for russ, kidneyforruss, Living Donor Paired Exchange, MoveIn, Ontario, organ donation, organs, Paired Kidney Donation, Religion and organ donation on December 4, 2018 by kidneyforruss. I received a kidney from a living donor in 2016. That this happened was a result of developments described in this article, a program run by Canadian Blood Services that would take all the available but incompatible donor-recipient pairs across Canada and seek to match them up. After going through that exercise multiple times with no success, the difference came about because an altruistic anonymous donor came forward. This resulted in a chain of paired donations and new lives for many people. There used to be only three ways off of a kidney transplant waiting list. The first was to find a healthy person from within one’s own pool of friends and family, who perfectly matched both the recipient’s blood and tissue types, and possessed a spare kidney he or she was willing to part with. The second was to wait for the unexpected death of a stranger who was a suitable physical match and happened to have the organ-donor box checked on their driver’s license. The third was to die. Although algorithms have made a tremendous difference in matching up eligible donors and recipients, the medical ethics around organ donation cannot be resolved by a mathematical model. I’m sure you will find the included discussion of a “God committee” fascinating. And in a related note, I’ll be participating in the Kidney Walk this weekend. If you are interested in supporting those living with kidney disease by making a donation, click here to go to my sponsorship page. This entry was posted in Uncategorized and tagged AI, Algorithm, altruism, Artificial Intelligence, Canadian Blood Services, Culture and organ donation, ethics of organ donation, ethics of organ transplantation, ethnicity, health insurance, how do I donate an organ?, How do I save a life?, kidney disease, kidney donation, kidney for russ, Kidney Foundation of Canada, Kidney Walk, kidneyforruss, Living Donor Paired Exchange, London ON, Ontario, organ donation, organs, Paired Kidney Donation, Religion and organ donation, Russ Sawatsky on September 20, 2018 by kidneyforruss. This “First Person” article originally appeared in The Globe and Mail on April 27, 2018. 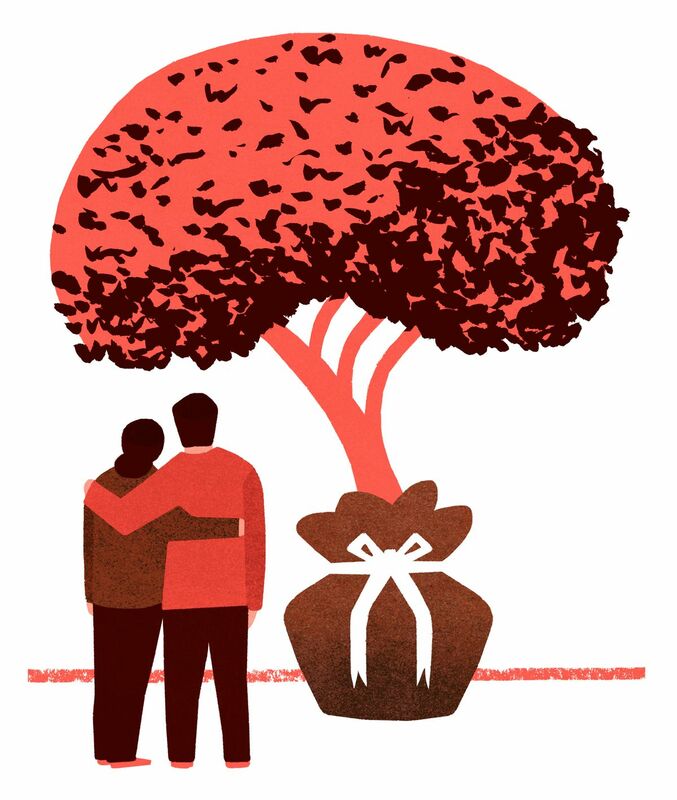 Twice a year – at Christmas and in early June – I hear from a man whom I have met only once, who lives in a remote village far from my Vancouver home, but with whom I share something intimate: our kidneys. I’ve got one, he’s got the other. I’m not supposed to know this man. Protocols in the national Kidney Paired Donation program decree that donors and recipients who are strangers should remain that way. Vern and I were part of a cross-Canada exchange involving multiple donor-recipient pairs that resulted in my daughter, Kasari, receiving a kidney from someone closer to her age and my kidney going to Vern, who is closer to my age and for whom my kidney will be a better match. While for some, donor-recipient confidentiality in a paired kidney exchange makes perfect sense, for inquisitive people like Kasari and me (and, it turns out, Vern and his wife, Shirl), engaging in something as intimate as a kidney transplant ignites our most basic curiosity. Who is now walking around with my kidney? What kind of a person is she or he? How does she or he feel about it? How is my kidney working out for them? And who gave my daughter the incredible gift of her new kidney? I mean, this is a vital organ we’re talking about. This is shared DNA. This is important, life-altering stuff. This entry was posted in Uncategorized and tagged British Columbia, ethics of organ donation, ethics of organ transplantation, how do I donate an organ?, How do I save a life?, kidney donation, kidney for russ, kidneyforruss, Living Donor Paired Exchange, organ donation, organs, Paired Kidney Donation, Vancouver on May 12, 2018 by kidneyforruss. Please read this article about the decision Humboldt Broncos hockey player, Logan Boulet, made to become an organ donor. In particular, note that there are 4500 people across Canada in need of an organ transplant, among them a two-year-old boy named Mason. 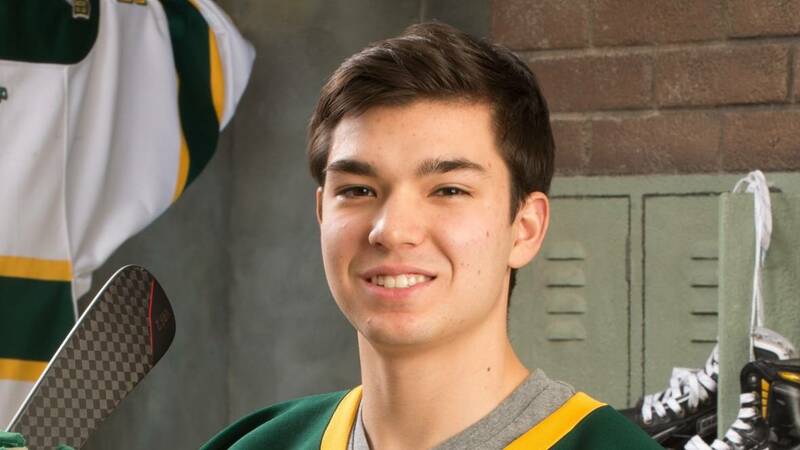 Many social media users say the donation of Humboldt Broncos player Logan Boulet’s organs has inspired them to become donors themselves, with health officials in three provinces saying online registrations have surged in the days following the horrific crash. A spokesperson for British Columbia’s organ donation agency said it saw more than a sixfold increase in online registrations over the weekend compared to two weeks earlier, and Ontario officials said registrations nearly tripled Sunday over the same period of time. Boulet, a 21-year-old defenceman from Lethbridge, Alta., was among the 15 people who died after the junior hockey team’s bus and a transport truck in Saskatchewan collided Friday. Fourteen others were injured. His godfather posted a statement on behalf of the family saying a surgical team from Alberta travelled to a Saskatoon hospital to conduct organ transplant procedures early Sunday morning. Neil Langevin said six people were set to receive the “gift of life” from Boulet, and his other organs would be donated to science. “Logan had made it known, and very clear to his family, that he had signed his organ donor card when he turned 21 just a few weeks ago,” Langevin said in a Facebook post. This entry was posted in Uncategorized and tagged altruism, British Columbia, Broncos, CBC News, ethics of organ donation, how do I donate an organ?, How do I save a life?, Humboldt, kidney for russ, kidneyforruss, Lethbridge, Logan Boulet, Ontario, organ donation, organs, Saskatoon, The Canadian Press, Trillium Gift of Life Network on April 12, 2018 by kidneyforruss. One year ago, on Friday, July 29, 2016, I received a life altering kidney transplant from a living donor. Once again, I write in humble gratitude for the willingness of two friends in British Columbia to put their names forward as donors, with Gerald Neufeld being the one who finally was the one to “go under the knife.” I think as well of the tremendous care I received while in hospital, and of the loving support of my wife Etsuko, and my four children, Rika, Keila, Aisha and Aaron, who were with me during that day. There were also friends from church as well as friends from our neighbourhood who visited with me and my family before, during and/or after the surgery. A lot has happened in the last year, much of it documented in this blog (“shout out” to Robert Chute — check out some of his books on Amazon — for helping me to get this little publishing venture off the ground). I seem to have become a “normal” person again: working 9 to 5 at the same place I had been before I went on dialysis — and that’s all right. In fact, I feel more “normal” than I have in 33 years when I was first diagnosed with kidney disease: no high blood pressure, no excess swelling or carrying around extra weight because my kidneys were not able to do the job, no tube coming out of my belly (I’ll avoid attaching the graphic photos for now) nor the related hooking up to a dialysis machine every night. I could go on. Thank you for your support, and thank you to every person who has registered as an organ donor. I’ll post something again as the day gets closer and as I get my donation page a little more up-to date, but allow me to wrap this up by mentioning that I will once again be participating in the Kidney Walk in London, a fundraising event for the Kidney Foundation of Canada. 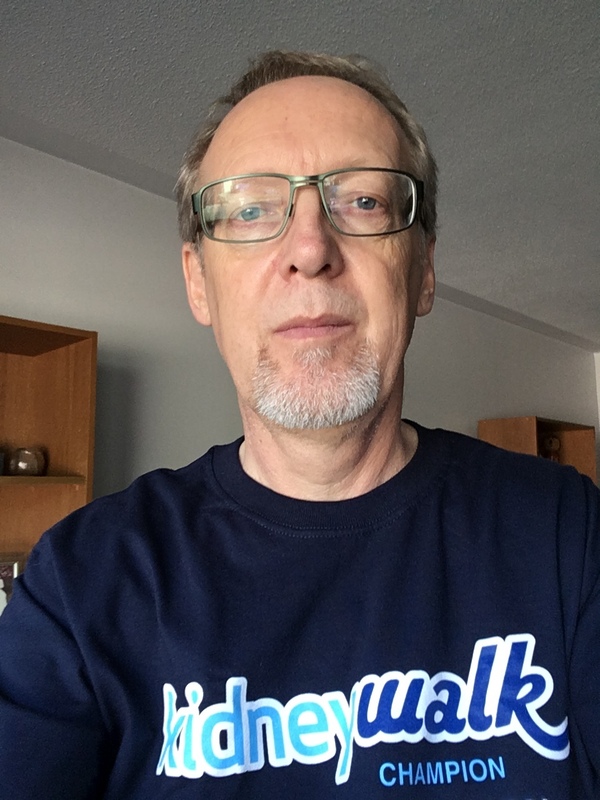 A recent photo of me wearing my Kidney Walk t-shirt from 2016. This entry was posted in Uncategorized and tagged British Columbia, Christianity, dialysis, ethics of organ donation, how do I donate an organ?, How do I save a life?, kidney disease, kidney donation, kidney for russ, Kidney Foundation of Canada, Kidney Walk, kidneyforruss, Living Donor Paired Exchange, London ON, organ donation, organs, Paired Kidney Donation, peritoneal dialysis, Russ Sawatsky on July 29, 2017 by kidneyforruss.